This product is only available for a limited time while supplies last. Add a fun human interface component to your Propeller projects with the Trackball Module from Parallax! Similar to the trackball found on many smart phones, this sensor is easily portable and can be used to replace a mouse in many applications. 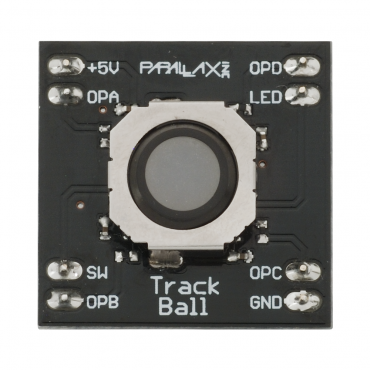 The Trackball Module comes with a built in center select switch and a red LED which can be programmed to light up the trackball when desired. Built-in Center select switch and red LED. Detect movement in the up, down, left, right and diagonal directions. 8-pin DIP module is ready for breadboard or through-hole projects. Built-in 1 kΩ series resistors for compatibility with the Propeller microcontroller and other 3.3 V devices. Communication: Four-pin variable-frequency binary signaling output (for trackball). Dimensions: 1.0 x 1.0 x 0.67 in (25.4 x 25.4 x 17.08 mm). Operating temp range: +32 to +158°F (0 to +70°C).